Yesterday morning: in a field in Wales, palms and face turned to the cushion-y golden warmth of the sun, noticing my yoga breath. The confidently green grass was as springy as a fresh sponge cake. Same time this morning: right hand clicking through work email. Left hand frantically redialling the Australian High Commission to deal with an expired passport before an imminent family holiday. A view enhanced by wet muddy boots. Local bacon so delicious that it could be a ‘gateway drug’ for wavering vegetarians. A scramble up a small waterfall. I fell in a stream, filled my shoes with mud and admired the view. No WiFi or internet or mobile phone signal. No digital cave to hide in. All the cakes. Chocolate, carrot, red velvet. Banoffee pie for breakfast. Giant lebkuchen (German biscuit ) in the shape of a smiling woman. A happy mess of heritage, birthplaces, languages, work places and homes. We don’t have much evidence that this weekend actually took place. No live-tweeting or vlogging or Insta-story. I just have an increased knowledge of precious gems, mindfulness and Dutch snacks; and continuing confusion over Welsh pronunciation. Happy birthday E, or is that ê? A global birthday cake. Only slightly offended that Australia got shoved off the side. A selection of Hong Kong holiday snaps, with side trips off to Chimelong Ocean Kingdom theme park and Macau. Photos by me and husband. #nofilter, as they say on Instagram. I’m @alifelessdigital if you enjoy that sort of thing. With thanks to mum and the magnificent Moks for their help and hospitality. Alien fruit On holiday, I like to relax. And take pictures of fruit. The sound of one glove clapping Lost gloves. Tiny tablets and toys It was a quiet morning at home. I was pondering the largeness of my multivitamin tablet. Fresh sourdough toast with jam and ricotta has made me ponder moving back to Sydney. 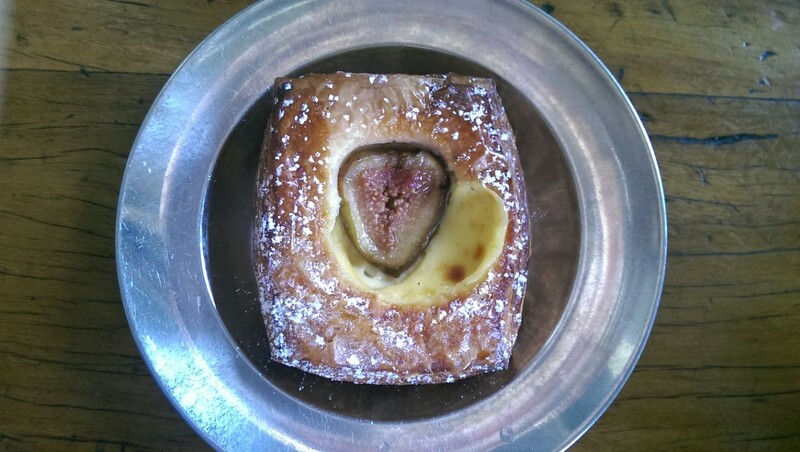 A fig Danish pastry has triggered layers of crispy homesickness. A pork and fennel sausage roll has almost brought me to tears. Daily London life is so solidly full and interesting that I rarely pine for Australia. So after nearly 3 years away, this visit has been surprisingly interrupted by ‘in situ’ homesickness. I am missing the thing as I experience it. That doesn’t make sense. But a dark chocolate and sour cherry cookie as big as my hand does. In gluten we trust. Where do you go when you press Home? Does your life have a ‘Home’ button? I’m back home (Sydney) after a brief visit to London (new home). My old house is empty and my new house is waiting for me. I’ve been suffering from an extreme case of blog procrastination. If this blog was a small child, well-meaning strangers would frown at its unsuitable footwear and thin arms. But hooray! All the planets are aligned, the Interweb is working, and my hands are warm enough to type. Quite a few people stumble here by searching for Lego. So to feed up my poor malnourished blog, here are some amusing Lego pictures. Does anyone ever get tired of cute Lego? Not me. Grrrr. No idea what this Lego minifig is. Some poor man trapped in a crocodile suit? We had a hard time trying to describe what ‘a hippy’ was to the kids. The ancient Chinese culture and traditions on display in Chinatown. The 9/11 memorial at sunset. At The Met I found out that mid-18th century French porcelain could be terrifying. So, the blog child-beast has been fed. And I can happily procrastinate away for another short while. Lego love for all the family. It really really hurts when I step on hard, sharp, pointy bits of Lego. I suffer through strange foot indentations because Lego is wonderful. Too lazy for words. Greetings from New York. I’ve just popped over for a high-end mini-break with husband. Greetings from New York. I’ve just popped over for a high-end mini-break with husband. If I was a proper blogger, I would be photographing my food and posting pictures up with tasting notes. Or reviewing the toenail art of the woman lounging at the bar. But the good camera is broken and we forgot to unlock our mobile phones, so we are without Wandering Web. We are officially free to just go about tourist-ing without sending out a real-life feed of NY delights. The air is so dry, I think my eyeballs are shrinking. Seared octopus with Umbrian chickpeas, red onion, pickled currants. (Il Buco). Uptown is not necessarily uphill. Gold brocade skinny jeans. (Admired, but did not buy). Gorging ourselves on back-to-back episodes of The Newsroom. 9/11 Memorial was perfect. Black pools of textured water – corrugated, smooth and flowing. Oooooh, my bunions are aching. $400 is too much for a toy baby standing reindeer. (ABC carpet and home). This post was the blog equivalent of ‘freshening up’ a stale bread roll in a microwave. A more nutritionally-balanced post will appear when I’m back. The fastest way to make friends is to have a brief chat, run around a park for a bit, then exchange phone numbers.This method seems to be working quite well for my son. We’ve been in London for only a few weeks, so we don’t know a lot of people over here. While I wonder how to make connections, my son meets children in the park and asks “Can I come over to your house to play?” Simple, really… I wish I had his confident approach to networking. School mum? Not yet – it’s school holidays, and I still haven’t officially heard when the kids start school. Aussie expat? Not right now – I’m more interested in becoming a local, rather than celebrating the joys of distant Sydney. Plus, like a new mother, I am getting a LITTLE bit sick of advice from strangers. Digital hipster? Not any more – I had lunch in a fashionable cafe in Shoreditch last week, and I felt like Dr Who going back in time, avoiding my past-self. Casually self-important young men glanced at iPads. They wore neatly buttoned checked shirts and not-too-tight plain coloured jeans. Pretty girls in ugly glasses and Scandanavian A-line skirts flicked through magazines and tapped away on iPhones. I knew the 90s music they were playing (My Bloody Valentine; Mazzy Star), and the coffee was good, but I am now a mature-age student at the school of cool. Chinese immigrant? hahahaha – I have been struggling to cook edible rice in a pot (I am really missing my rice cooker!) My non-Asian husband does a much better job at it. Maybe I should browse online for people who will overlap me in a Venn diagram of interests. Meet up instead of just emailing and admiring from a distance. Or maybe I’ll try my son’s approach? I assembled this card just before I left Sydney, and took a dodgy phone picture. 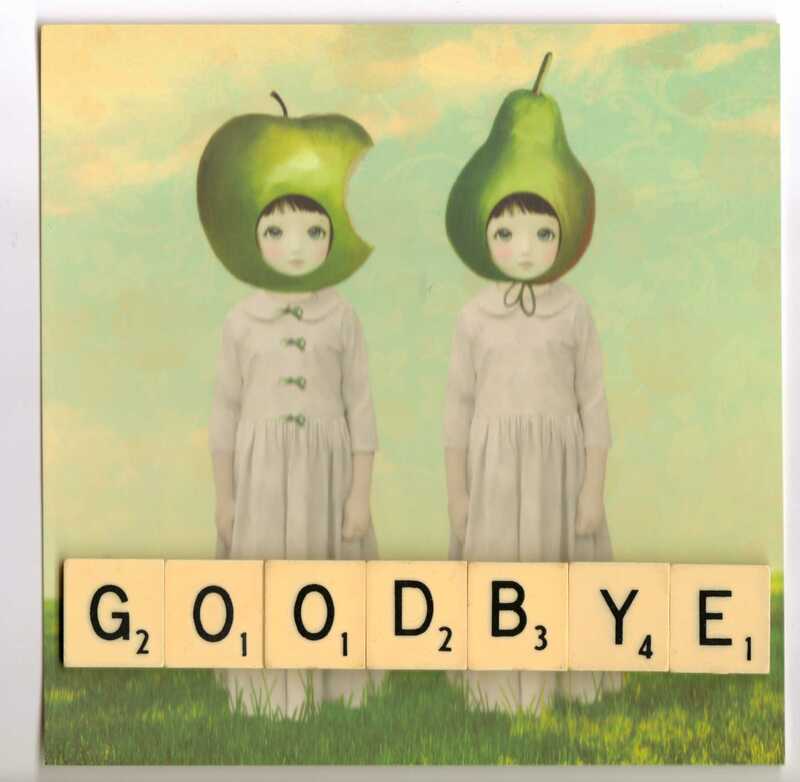 The card is by ‘Art and ghosts‘ and I added the vintage Scrabble tiles. I am not part of the flying sisterhood. As the exhausted, grim-faced mother unbuckled herself and struggled to her feet yet again, I just felt sooooo pleased I wasn’t flying with a baby. – Leave kids behind at airport staring dumbstruck at 1 kg blocks of duty free chocolate. – Ensure husband’s inflight TV doesn’t work so he has to hold the baby. – Find all the sick sacks or vomit bags you can as soon as you sit down. Sometimes one is not enough. – For several years before you fly, strictly control the amount of TV your kids are allowed to watch. Then let them loose on the plane. Yes, you can watch that film 3 times in a row! – Replace your real baby with a life-like educational doll. Much, much more placid. – Remember to charge the iPad fully. And stop lecturing your toddler on why they should be gentle with it. If you hand it over, it is possible that they want to bash Dora the Explorer’s head with a fork. – For girls, try to guess which ridiculous diamond-encrusted watch mummy likes in the airline magazine. – For boys, try to assess the relative probability of different flying-related risks on each route eg ash clouds, engine failure, computer malfunctions, pilot narcolepsy. – Have lots of “skin to skin” time with your baby. People won’t make eye contact with you if you’re naked. – Drop a bag of small sweets on the floor and let the kids eat as many as they can find. Sweets that roll well are more fun.